Click here to listen via the BBC World Service website. This entry was posted in Broadcasters, International Broadcasting, News, Radio History, Shortwave Radio and tagged BBC Monitoring, Caversham Park, Julie on June 5, 2018 by Thomas. BBC Monitoring is leaving it’s home of over 70 years and moving to Central London. On BBC Radio 4 yesterday I was listening as I drove home from a ‘Breakfast’ shift, 04h30 – 16h30 local ..! It looks like it will be repeated tomorrow, Saturday, 08.July at 06h07. So via BBC iPlayer radio it should be possible to receive this programme. Enjoy a programme that tells the ‘history’ of BBC Monitoring from WW2, thru the ‘Cold War’ to the present day. Here also is an additional link of interest https://monitoring.bbc.co.uk/login and if you don’t want to register straight away try the ‘preview’ facility https://monitoring.bbc.co.uk/?preview=true With the G20 taking place in Hamburg at this time, there will be some interesting commentary there. Thank you so much for the tip, Kris! I wish I could have had an opportunity to tour BBC Monitoring prior to the move from Caversham Park. Have any SWLing Post been there? This entry was posted in Broadcasters, International Broadcasting, News, Shortwave Radio and tagged BBC, BBC Monitoring, Caversham Park, Kris Partridge on July 7, 2017 by Thomas. 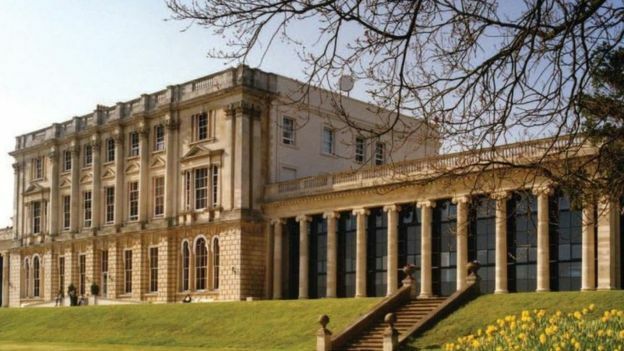 Caversham Park became the BBC Monitoring Headquarters in 1941 and in light of recent news that, due to a £4million pound funding cut, it’ll be closing its doors for good, Rajan Datar visits the iconic building. Coordinating Editor, Chris Greenway gives a tour of the building and a sense of its history, while Lina Shaikouni gives a taste of what the service provides today. This entry was posted in Broadcasters, International Broadcasting, News and tagged BBC, BBC Monitoring, Caversham Park, Southgate ARC on August 22, 2016 by Thomas.